I did not get the travel journal finished to take with me. The chipboard pages are covered and the binding edges all trimmed in washi tape. You can see the page templates made from file folders. I got the designs from a Heidi Swapp journal. There was a great variety to use as a jumping off point for designing my own for future albums. The stamps with letters/ numbers are visible to the right and my paper selection on the left. The drive down was a nightmare. I chose to try the interstate (which I hate to use) because I thought it would be faster. Such a bad decision. The northeast corner of Arkansas enroute to the interstate was not a pleasant drive for a variety of reasons. Add construction on the interstate from Conway to Texarkana and I was so mentally exhausted at the end of the drive. At one point I only went 4 miles in 45 min! The Texas Music Awards was a great experience. I made some good business contacts. Was nice to meet artists face to face I've only been networking with and promoting on-line the past three years. The drive home using only a state highway taking me through the Boston Mountains was much more pleasant. I stopped in Eureka Springs Arkansas for lunch and would like to have stayed the night just because I LOVE that town. I swear Eureka Springs is like the town of Eureka in the movie channel. Just a a different air to breathe - and so relaxing. Maybe it's just me but when I cross the city limit line I feel as if I've come home. If you ever want a truly relaxing vacation I recommend Eureka Springs Arkansas. The Crescent Hotel is the place to stay if you want ghostly experiences. Otherwise, the only place I stay when I'm in town is the Best Western Inn of the Ozarks. There are two Best Western's in ES so make sure you look for Inn of the Ozarks. For now, I invite you to travel around our community and see what my WOYWW friends are up to. When this post greets you I will have just returned home from my first trip to Texas. So I'm scheduling this. If I can add a couple more pics between then and now I will. For now, not really exciting. You are looking at one of the three composition books upside down. This is so I can get a better stroke with the brush. You can just see the other 2 in the background. Okay - 3 Composition books = 1 per each quarter of the year. I've already been using one for the first quarter and nearly finished as a plain 'Daily To Do' journal process. I'll go back and make it blend with the other three quarters over the year - maybe. But I wanted to get these other journals prepped for the remainder of 2014. In the first quarter journal I've written my 'daily tasks' on the right hand side of the page, then when I turned the page, anything extra like tracking numbers for packages, addresses of people I've mailed stuff to, etc were written on the back of that dated page. 1 piece of paper, 1 date, lots of activities. In the remaining three quarters I needed to move things a bit to accommodate our weekly artistic challenge at The Documented Life. So I decided to set the pages up like a typical dayplanner 2-pg spread. My Daily Tasks will be on the left hand page and other items, as well as doodling will be on the facing page... incorporating the other items into the 'art work'. But I did not want to be limited to just ink/ gel pens for my doodling. What if I want to add bold color with a marker or some water color? Typical notebook paper pages would never hold up to that type of playing. At first I had planned to cover that page with a sheet of watercolor paper. But then I realized doing that on every page would add MORE bulk than I'm already going to have with the tip-outs and art challenge pages. So I opted to put a coat of gesso on every right-hand page. I'm working all three journals at once for this process and it goes rather quickly. A coat of gesso only takes a couple hours to dry enough that I can slide a piece of waxtex between the pages and start the next one. This process is still going to take a few days to complete all 3 journals - and I'm going to lose some prep time over the weekend while I'm on my trip. My plan is to just work through them as quick as I can so that I'll be able to start using the Documented Life Project planner with the beginning of April. This morning, I got all of the calendar pages trimmed to fit inside the journal and washi-taped the seams. They are all ready to add into the journals. Next week I'll show you more progress and some added items I picked up at Office Depot. MIXED MEDIA MONDAY - Washi Tape! My Washi Tape arrived in the mail on Wednesday. I still can't believe I bought so much on our trip. The 3 packages of 4 in the center of the picture were purchased on our trip to Springfield this past weekend. I found them at Office Depot. They also 2 separate displays of Scotch brand Washi Tape. Scotch was $2.99 per roll. These are called IE by Office Depot in a 4-pk for $4.99. Much better deal and I found colors I liked better than from Scotch. You know me... if it isn't organized I can't do anything so my first task was to determine the best way to store my washi tape AND have EACH roll visible for when I'm creating. Most of my washi tape will be used on the Documented Life Journal and what prompted the washi tape purchasing spree. I had a box storage that seemed to be the perfect fit. I cut the lid off, made dividers using foam core board. I spaced the dividers based on the width of the rolls. some were wider than others. I do have 3 rolls from SU. Normally, I would store these with SU product but since I will primarily be using this for DLJ and nothing else, I decided to keep everything together. Oh yeah... one more thing. See the little squares of white paper in the bottom left of the box -below the blue washi. Those are preprinted labels I made. Each roll of tape has a label on the inside of the spool with a company name. I like to give credit where credit is due. 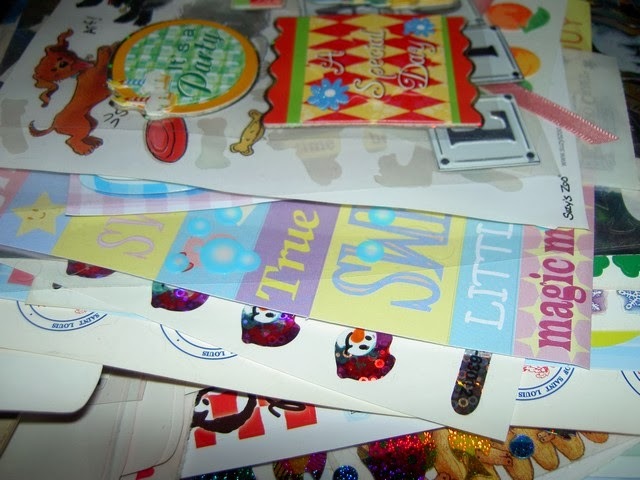 Example: the rolls in the very top right - from the skinny orange to the pink with brown polka dots - Heidi Swapp... long before we knew what washi tape was. The tape is slick and more 'tape' than paper but the same concept. These rolls came to me in a Secret Sister box my very first year as a Quacker from sister Maggie. I FINALLY made time to start putting the Texas travel journal together. I leave Friday LOL Since taking this picture last night I've covered the front and back as well as the inside covers of the chip board journal with sections of Texas from the old road atlas. Later today I'll cover the inside pages, make some flip-out pages and add the embellishments. Beneath the chipboard album you'll see the calendar pages for the Documented Life Project journals. I also got those seamed together with washi tape this morning. The headbands in the upper left corner will be used as elastic closures for the journals. Tons to do today. I'll try to do some visiting tonight or tomorrow. This is my embossing folder swatch ring. I used the Tim Holtz style tag in GP white to emboss each image. You'll notice the top of each tag grouping is a different color. For now my categories are shapes & signs, frames, floral/ garden, celebrations, fall, Halloween and Christmas. I embossed the design on the color tab cut 1.5" deep and the width of the tag. The color tab coordinates with each category in the decorative box storing my folders. I embossed a 4 x 6 card of the folder in it's matching category color and adhered the mat to the front of a file folder made from repurposed file folders. You'll notice the color on the edges of the folder. I attempted to stamp my own washi tape using masking tape. Although it holds the folder ends closed, the image did not stamp well on the masking tape. I'll stick to the white paper tape from now on. This pic gives you a close up of the tab, again punched from the same color for that category. I've written the name on the tab. What you can't see is below folder opening. At the base of the tab I've written the company name. If it is a Sizzix and purchased through SU, I've put both notations on the tab. In putting this process together, I realized I had more folders than I thought. 25 in all. Then I bought 3 new ones at JoAnns last week. Their Darice folders were 5/ $10! Couldn't pass that up. I bought 3 for me and sent the other 2 to my SIL in Oklahoma. I knew they were ones she would enjoy based on a request for mats from my folders. Next week I'll show you a picture of the outside of the box and how I have it stored in it's new Sizzix area of the studio. How do you store/ organize your Embossing Folders? Are they easy for you to find when you need one? Or does hunting through a box work best for you? Okay - not really. But I see yummies to play with. MIXED MEDIA MONDAY - Cards Galore! In the mean time, while at my SIL's this weekend, we played with the challenges at Virtual Stamp Night (VSN) on Splitcoast Stamper (SCS). If you are not familiar with VSN, they do this big gathering on-line once a quarter (I think that's about right). Each quarter has a theme and there are 12 hostesses. Each hostess is assigned an hour when she will post her challenge for us to do. They may choose a color scheme, a technique, theme that coordinates with the big over-all theme. This month it was Weather Or Not - so all the challenges had something to do with weather. Here are the 11 (I forgot to do the last challenge hehe) cards I made with a subtitle. Clicking on the picture will give you a larger view. Love the snow globe set from SU (retired). In like a Lion with clouds or scene. This lion is from a color page. Great place to get digi images! Gray tones with only 1 pop of color. Baked Brown Sugar is my favorite new 'bear' color! The border trim is printed on the paper. Felt good to play with things. Amazingly, except for the slab and the twine I had packed almost everything I needed. Only used 3 or 4 items from Rhonda's stash! I've managed to keep the desk pretty clean this week. Aside from doing a project I'll show you tomorrow, the only other thing I've worked on is gathering the supplies for The Documented Life Project. In the mean time, here's a bit more about The Documented Life Project. While looking at others blogs last week I came across an incredible piece of art. I can't show you a picture but if you click on Art to the 5th, you'll see what I mean. This is called The Documented Life Project. This journal is the brainchild of Lorraine Bell. The book is actually 3 books in one. Lorraine and most of the other over 1200 members of this project use a softcover Moleskine Weekly Planner. With the planner as a base, the concept is to have something to track your daily life, include art and make it YOUR OWN. Well, you know me... I have to invent the wheel. Partly because I don't want to wait to start putting mine together - we are already into Week 10 of the challenges and additives. The other reason is I've discovered the one thing that works best for me as a dayplanner - well two things - a Monthly Planner from the Dollar Store and a Composition Book. I use the planner to keep track of Bob's schedule but my daily tasks are written on a page in the notebook. I'm thinking The Documented Life Project will let me combine these two items into one AND give me the opportunity to include some art in my day - something that has been lacking of late. It isn't. I've not even had it out of the bag since Week 2. I'm not sure why other than the composition notebook and I seem to connect. I'm a list maker and I think the preset planner took that away from me. The Documented Life Project will allow me to still use my composition book, to make my lists but I hope to incorporate pieces of the disinherited planner. I've been gathering supplies while I try to get the studio in order so I hope to show you the beginnings of my book in 2 weeks. There will NOT be a blog post next Monday as I'll have nothing to schedule and I will just be getting back from a road trip (unless weather turns, keeping me at home). We'll see.